Summary: Oh dear… you know you have a ‘debatable’ holding in your portfolio when the highlight of a results statement is an 18% reduction to the workforce. That sadly is the case with GTC, as the geoscience data specialist has slashed its cost base and now hunts for income sources away from its cash-strapped oil clients. These H1 numbers were otherwise quite unremarkable, although the new boss has issued a few glimmers of hope for some sort of turnaround. I continue to hold. Although I was not expecting a miracle from these results, I had hoped GTC could extend the return to profitability it enjoyed during the preceding second half. In the event, an underlying profit was scored during this first half — but only just. The headline performance appeared somewhat healthier than the corresponding achievement of the prior year. Revenue gained 23% while a £74k underlying profit (excluding redundancy costs) was a lot better than the £697k loss of H1 2016. Mind you, these GTC figures were bolstered by a recent acquisition while last year’s H1 was particularly awful. In years gone by, GTC has tended to make most of its money during the second half, and I am hopeful that will be the case again for 2017. As my previous write-ups have indicated, GTC has suffered badly during the last year or two after many oil clients stopped buying the group’s geoscience data. “Our goal is to build out from our core upstream oil and gas market to become a leading solutions provider to the wider natural resources industry. We are targeting an expanded customer base that invests billions of dollars each year making decisions that are ‘geographic’ in nature and which require specialised analytical skills and tools, to solve problems that involve highly complex spatial data. Whether the changes actually prove to be “transformational” is of course another matter. During GTC’s heyday, these oil-data products could produce an operating margin of 20% or more. It is quite unusual for a company’s results to include a “reconciliation of cost base” table… and it is even more unusual when this table is the most interesting feature of the statement. Yet (sadly) that was the case with these GTC numbers. The like-for-like cost base for the preceding H2 was £5,127k, so this H1’s cost base of £3,934k does give some hope that a better level of profit can emerge should revenue improve. I made the point when I reviewed November’s annual figures that GTC’s accounts contained a few niggles. Capitalised development costs remains one area I’m unsure of. I wrote back in November that I had expected the group’s hefty intangible expenditure — which is not charged against profit but instead travels directly to the balance sheet — to reduce substantially from 2017. I do not mind companies capitalising certain expenditure, just as long as the associated amortisation is adequate and reported profit is not boosted artificially. However, GTC’s reported profit has been flattered in the past by this accounting practice — and sadly these H1 numbers extended the trend. H1 intangible expenditure of £529k compared with depreciation and amortisation of £406k to leave a £123k difference — a difference that would have created an operating loss had the amortisation charge reflected all of the expenditure. I am also puzzled about GTC’s stock levels, which November’s annual results admitted had surged by £775k to £1,067k. At the time, GTC suggested the movement was more of a timing issue than a backlog of unsold products. However, these H1 accounts show stock levels reducing only slightly to £904k. So I wonder now whether the group’s new reports are taking longer to develop or longer to sell. Still, capitalised costs and stock levels may become inconsequential in the long run if GTC’s turnaround plan comes good — or goes wrong. For now at least, cash levels appear adequate. 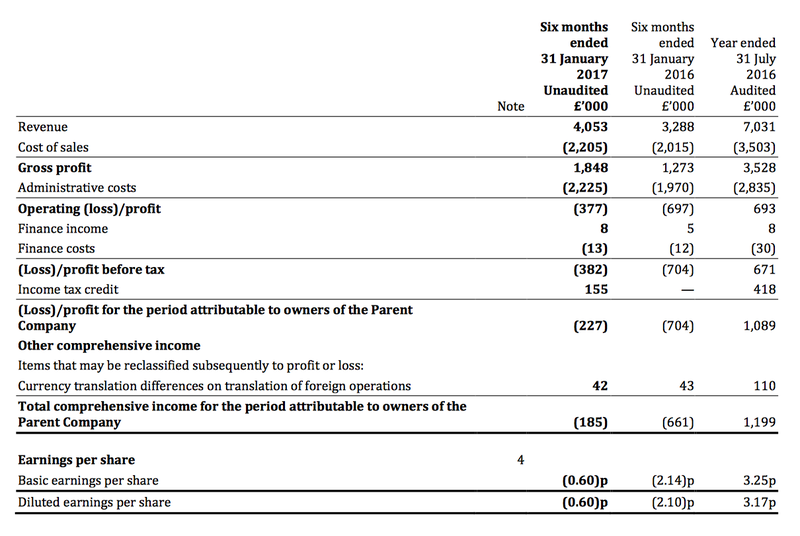 A £480k tax refund helped shore up the net cash position at £1.4m (3.7p per share) after adjusting for a £400k earn-out payment owed to the former owners of an acquisition. The balance sheet continues to carry freehold property with a £2.5m (6.6p per share) book value, too. “Any material recovery in discretionary exploration spending is likely to be a slow build. We do however take some cautious encouragement from recent trading. Since 31 January 2017, our software and data sales have continued to grow. In March 2017, we signed an agreement with the OGA for them to license our UK MultiSat data across the North Sea. This is the third sale of our products and services to the OGA during FY 2017. At what point any of this eventually translates into a proper recovery unfortunately remains anyone’s guess. I noted in my Q1 review that GTC was one of my “debatable” holdings, what with the firm lacking proven management and a resilient operating history. These results have not changed that verdict and, if anything, have underlined the difference in quality between the group and other companies in my portfolio. In fact, I am not tempted to study GTC’s valuation and I won’t consider buying any more shares — and I must admit I do wonder whether I should remain an investor at all. However, for now at least, the business still enjoys net cash and continues to provide a range of specialist data that boasts some recurring revenue. I also like the fact the new boss is not afraid of making tough decision after firing 18% of the workforce. There are glimmers of a revenue turnaround, too, and you never know, maybe the leaner cost base plus greater client activity can one day combine to regain the high margins of yesteryear. Famous last words, but I do have the impression the worst at GTC has been and gone. Nevertheless, I still recognise that my money may be better served in other businesses with greater tenured management and more reliable track records. It appears GTC is presenting at a ShareSoc event on 14 November. Last year’s annual results were published on 8 November, so I guess this event will showcase the 2017 numbers. I am hopeful that GTC has agreed to the presentation because the 2017 figures and 2018 prospects are not that bad. Mixed news. However, the statement should be read with GTC’s £9.3m market cap (at a 25p share price) in mind. Against what remains a volatile market, Getech has worked to enhance its cash profitability through cost management and has strengthened the commercial positioning of its products and services. The net impact of these steps is partially obscured by exceptional costs and a year-end cash timing issue. So a mixed update to follow. During FY 2017, Getech closed sales with a total value of £8.5 million, of which £7.7 million will be recognised as revenue in the 2017 financial year (FY 2016: £7.0 million). The balance of £0.8 million relates to FY-18 deliverables. Revenue of £7,700k for 2017 compares to revenue of £7,031k for 2016. However, after H1 revenue of £4,053k, H2 revenue must have been £3,647k and compares to H2 2016 revenue of £3,743k. It does not seem the H2 revenue performance was that great. Let’s not forget Exprodat Consulting was purchased during June 2016 and GTC’s 2016 annual report revealed Exprodat had produced revenue of £357k between 14 June 2016 and 31 July 2016 (the period of ownership) and revenue of £2,408k during the 12 months to 31 July 2016. Therefore, GTC would have produced revenue of £9,082k for FY 2016 had it owned Exprodat throughout, so revenue of £7.7m for 2017 indicates an underlying 15% revenue slump. I suspect the drop for H2 2017 was greater than 15%. A significant programme of cost saving measures implemented during FY 2017 resulted in underlying costs on a like-for-like basis being 32% below that in FY 2016. However, restructuring costs (£0.5 million), M&A payments (£0.5 million) and debt repayments (£0.1 million) resulted in an additional £1.1 million cash outflow. GTC’s interim results indicated like-for-like cash costs had dropped 33%, so the 32% full-year decrease is just about in line with that. Those interim results also showed the 2016 like-for-like cost base at £11,035k, so a 32% decrease gives costs of £7,504k for FY 2017 and therefore £3,570k for H2 2017 (after £3,934k for H1 2017). So revenue less like-for-like cost base gives a ‘profit’ of £119k for H1 2017, £77k for H2 2017, and £196k for FY 2017. Cash balances at 31 July 2017 totalled £1.7 million. This compares to an opening cash balance for the year of £2.8 million. The reduction in cash was temporary, reflecting the timing impact of several unforeseen and exceptional payment delays, which at the year-end totalled £1.0 million. These late payments have now been received and at 18 September 2017 Group cash balances totalled £2.4 million, which is reflective of more normal working capital conditions. Adjusting FY 2017 for £1.0 million of delayed customer payments and a combined £1.1 million of redundancy, M&A and debt costs, Getech’s operations delivered an underlying year-on-year net cash inflow of £1.0 million. At first glance, a full-year net cash inflow of £1.0m — albeit adjusted for tardy payments, redundancy costs, and so on — does not look too bad to me. Of course, there may be further cash outflows to consider before a free cash figure can be derived. Capitalised development costs in particular may be significant in this respect. Overall, it appears full-year cash went from £2.8m to £2.4m, so a drop of £0.4m. Add back the £1.1m of restructure costs etc, and the net cash inflow comes to £0.7m. Then consider that H1 2017 enjoyed a £480k refund of earlier tax payments and the underlying net cash inflow comes to about £0.2m — which matches the £196k ‘profit’ figure cited above. H2 cash movements do not look great. H2 cash went from £3.0m to £2.4m. 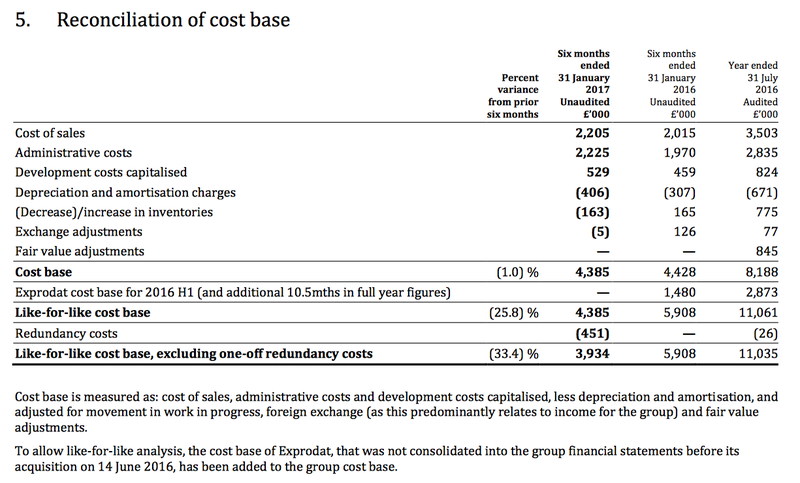 H1 redundancy costs were £451k, so H2 redundancy etc costs were £1.1m less £451k = £0.65m — i.e. the overall cash difference for H2. As such, it seems to me H2 did not produce any underlying cash — and probably reflects the £77k ‘profit’ figure cited above. Debt at the end of H1 was £900k, so £100k paid off during H2 gives £800k. Net cash after the late customer payments have been collected = £2.4m less £800k = £1.6m. The balance sheet also carries freehold property of £2.5m. Getech’s 31 July year-end places the Group’s reporting cycle out of phase with our customers’ budget cycle. This also means that we are looking to close year-end sales (or resolve exceptional payment delays) at the peak of the holiday season. The Board has therefore decided to move the Getech Group’s year-end and reporting Accounting Reference Date to 31 December. · Thereafter unaudited interim results will be published within 3 months of 30 June and audited final results within 6 months of 31 December. I guess a December year-end is more conventional than a July year-end. Of course, the change will make evaluating the group’s performance — which has not been easy of late given various acquisitions — even trickier than before. While a “healthy inventory of revenue” sounds promising, I am not quite sure what to make of “pre-fund FY 2018 product development“. I suppose it could be hinting at significant cash expenditure in this department next year. I wrote in the Blog post above that GTC was a debatable holding. For now I am minded to hang on in there. The balance sheet shows net cash and freehold assets of £4m, so leaving £5m — in theory — for the operational side of business. Assuming GTC can operate at least at a cash break-even level, then it ought to muddle through until better times emerge. I don’t think it will take much of a recovery to put the ‘£5m’ valuation into perspective. I am trusting moves into new areas alongside the group’s oil and gas heritage can help the business recover.